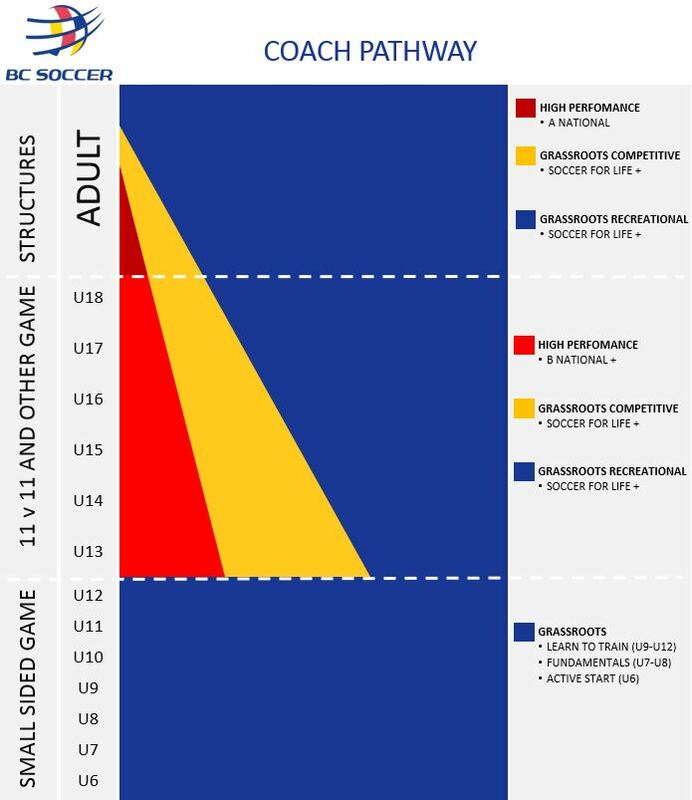 BCSA's Coach Pathway is the guide for coaching certifications for the different levels of soccer in BC. WVSC works hard to make sure that every coach has taken the appropriate coaching courses for working with their team. We are one of the few clubs that have ensured that all head coaches have their coaching certification. As the governing body for soccer in Canada the Canadian Soccer Association is responsible for training coaches from grassroots to national team level. With the increasing number of players registering with clubs across the country this represents a considerable challenge. In order to meet this challenge the Association has developed a Long Term Player Development (LTPD) Model and tailored the Coach Education Program to this Model. 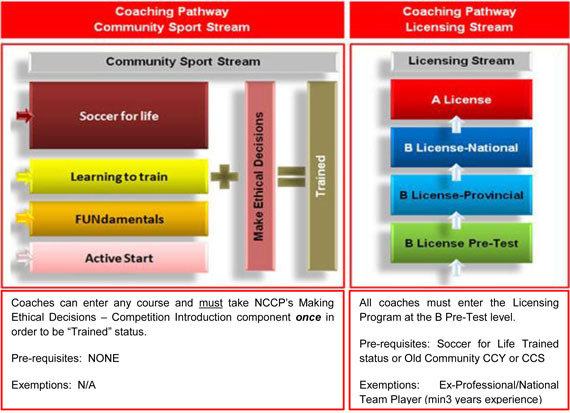 As a result a two-streamed education program (COMMUNITY SPORT and LICENSING STREAMS) have been developed in conjunction with the NCCP and our provincial/territorial partners that we feel will meet the needs of both developing coaches and the sport itself. This stage introduces players to disciplined training and begins to develop their understanding of principles of play alongside their skills practice. Repetitions are important to develop technical proficiency, but creating a fun and challenging environment is still paramount to stimulate learning and promote a love of the game. Game formats can range from 6v6 to 8v8 as players advance through this stage, and again a simple league schedule can be created, but no standings should be kept because the emphasis is still FUN. All players play equal time and try all team positions, including goalkeeping, and the training to competition ratio should be 2 to 3 training sessions for every game. This course introduces team coaches to the art of goalkeeping. The contents of this course are designed to give team coaches some basic knowledge about the techniques and skills involved in being an effective goalkeeper and most importantly, giving the coaches enough information and direction to be able to effectively introduce goalkeeping into their weekly team training sessions. Previous goalkeeping experience is not required. This is not a NCCP certification course. The B Pre-Test is a non-certification course that is a mandatory pre-requisite for any coaches wishing to pursue the Canadian Soccer Association's B License Program. The main purpose of this course is to give coaches the proper methodology needed to detect and correct errors in technical development and small-sided game situations. This course does involve some theory components, but is heavily geared towards the ability of the coach to plan and run effective sessions based on pre-selected technical and tactical coaching topics. Successful participants will be eligible to move forward in pursuing B Provincial License certification. The B Provincial License (B License - Part 1) focuses on working with high performance youth soccer players U13 and older. This course involves both theory and practical coaching work. The theory components include: stages of development, methodology of training, session planning and the laws of the game (11-a-side). The practical components are heavily geared towards the ability of the coach to plan and implement effective training sessions based on a variety of pre-selected technical and tactical coaching topics. Each participant will undergo two (2) practical coaching assessments. Successful participants will be eligible to apply for completion of Part 2 of the B License Program. All coaches who were unsuccessful in their practical assessments are required to re-take the respective course but will only be charged for the re-assessment course fee (see below). When registering, coaches must indicate their re-assessment status to receive the reduced course fee. The B National License (B License - Part 2) focuses on working with high performance youth athletes and older ages. This course involves both theory and practical coaching work. Each participant will undergo two (2) practical coaching assessments. Successful participants will receive a Canadian Soccer Association B License. Pre-requisite: Successful pass of the B Provincial License and approved application though the BC Soccer Development Department. Registration: This is a Canadian Soccer Association course, however ALL coaches from British Columbia who would like to attend this level must register through BC Soccer. British Columbia Soccer Associationâ€™s Soccer Development Department and Coaching Committee has established the following selection criteria for forwarding coaches to the Canadian Soccer Associationâ€™s B License course. All applicants who have met the pre-requisite and have registered through this process will be reviewed based on the following criteria. Please note that only 12 spots from BC are available on this course as per the CSA guidelines. All applicants will be notified regarding their status by February 15th. The CSA 'A' License Program is divided into two annual periods of ten days. Both parts will be conducted as residential courses, approximately twelve months apart, at the National Training Centre in Toronto . Each candidate will be required to complete a limited number of assignments between parts 1 and 2. Both Part 1 and Part 2 will include practical and theoretical aspects of study with the Final Practical assessments being held during Part 2 of the course.